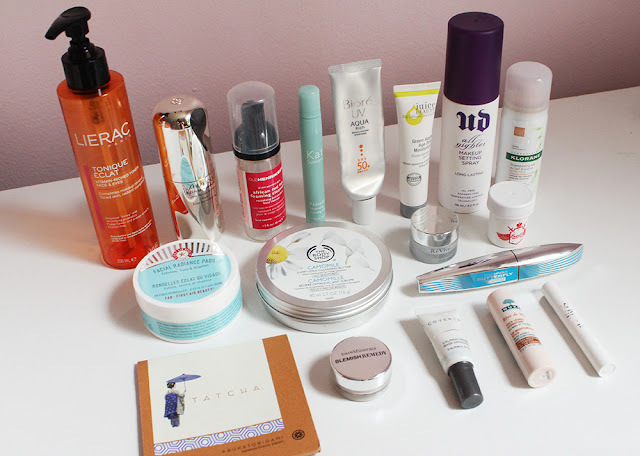 May and June 2015 Empties and Blog Updates! It's been a few weeks since I last sat down to type up a blog post and I've made a few changes to this space that I wanted to quickly mention. After many years, I've decided it's time I bought my own domain and rebrand my blog to make it more relevant to the content. Angelic Betrayal is a name I borrowed from a video game I played in way back in middle school and it didn't convey anything about what I write about here. Instead of thinking of a beauty themed blog name, I wanted to expand my horizons and make it more general since I have some travel and lifestyle content once in awhile. I plan on incorporating more non-beauty posts going forward to keep things a bit more interesting. Of course beauty will still be the main focus but I'm excited to give myself a reason to brunch a little more to do some restaurant reviews. Over the course of the next few months I look forward to adjusting the layout of my website into something more modern and reader friendly. Let me know what you think of the new name and if you have any suggestions for what you would like to see on According to Kar Yi! My May and June empties is a bit late because I was out of the country at the end of last month so this is better late than never. I'm honestly not very interested in writing long, drawn out mini reviews every two months anymore but I'll keep doing these as a record for myself. Let me just tell you the products I loved and/or hated and you can assume the rest were just decent.... Feel free to ask me in the comments about a particular product and I'll be happy to give you my thoughts that way! On another note, I've pretty much given up on my Project Make a Dent items and have moved onto other things.... I'm thinking maybe I should try a Pan That Palette challenge but I have a feeling that won't be very effective either. Here's to hoping I have some makeup pan to show you in my next empties post!